1. What to know before buying pachysandra plants? Before you do any planting add some organic compose to the soil and give it adequate time to break down or work itself into the earth. Since the Pachysandra loves to keep cool, find a nice shady spot in the yard, preferably under a tree. 2. Benefits of pachysandra plants? Pachysandra plants are perennial grounds cover that can be used alone or to provide a lush green base for ornamental flowering plants. 3. All about Pachysandra plantings? Spring is a prime time for creating some of the most fabulous art there is—living plant appeal. 4. All you need to know about pachysandra? All you need to know about pachysandra shrubbery is that the coverage is great. This plant can make even the worst gardener look like a Guru. 5. Why use pachysandra as a ground cover? The evergreen sub-shrubs or herbs of the boxwood family called pachysandra—particularly Japanese spurge and Allegheny pachysandra—are popular choices for landscaping and gardening around the United States. 6. How to buy the best pachysandra plants? Pachysandra plants are beautiful green plants that make excellent groundcover. The best way to buy pachysandra plants is to buy a flat of them from a nursery like JW Pachysandra and plant them in soil that doesn’t have too much pH. 7. Pachysandra plants for sale and what to look for? Before you set out to buy your Pachysandra plants here are some things you need to look for. Just like fruits and vegetables need to be looked at thoroughly, so do plants and especially Pachysandra. 8. All about Pachysandra plants? Gardeners desiring a ground cover that is not only beautiful, but also grows will in those tricky shady areas will love Pachysandra plants. 9. What is a Pachysandra Farm? Some people refer to a Pachysandra Nursery or Nurseries as being a Pachysandra Farm. 1. Pachysandra as a natural habitat? All the different varieties of pachysandra are earth-friendly landscape choices. They cover the ground, helping to retain moisture in the garden - so you'll need to water less. And more plants mean more oxygen production, another environmental plus. 2. Save time and work? Ground covers like pachysandra are effective ways to keep weeds out of your garden. When these ground-hugging plants spread out, there's less space for weeds to gain a root hold. Using pachysandra also means you don't have to mulch as much because ground covers, form their own "green" mulch. 3. Using evergreen ground cover plants in your landscaping design? When you plant a perennial ground cover, such as pachysandra, you do it once then reap the benefits for years. If you have a huge area to cover, selecting a fast-growing ground cover like pachysandra will fill in the blanks quickly. Use flowering perennial ground covers to add a little something extra to your space. Pachysandra is particularly appropriate to plant when you are looking to add texture to your yard. 5. Solve soil erosion problems? If you have a sloped yard, you also may have an erosion problem. Exposed soil is unstable, and a hard rain can quickly create ruts that carry off precious topsoil. Planting earth-grabbing groundcovers, like pachysandra, holds soil in place, even on an incline. 6. Shade growing evergreen that grows where grass can't? Pachysandra is the happy response to the common complaint: "Why can't I grow grass here?" Lawns can't grow everywhere, and turf grass often has trouble taking hold in shady spots, or under trees with shallow root systems. Planting a variety of pachysandra can transform a sparse lawn into a lush landscape particularly in shaded locations. This is also a great time to remove any or all weeds or vines that may be there. Remember that the closer plants are planted to each other, the faster the area will fill in. 8. Plant pachysandra underneath your deck? Because Pachysandra is such a naturally good fit for damp dark areas of your yard, planting them under your deck is a perfect solution to an unsightly yard problem. 9. Pachysandra and your pet? Home gardeners like planting lush ground covers; it is attractive all year, and can prevent soil erosion. I have tried chewing on pachysandra leaves and stems just to see what it taste like, with no side effects. Deer do not like it at all and I have never any other animal eat it either. I did find some mice make a nest in some 2 year plants that were under some wooden shades. 10. Is pachysandra too invasive for garden use? Pachysandra is a plant that's known for being able to grow in the shade. It's also evergreen, so it looks good all year. Unfortunately, it's also known for being very invasive. 11. How to use Pachysandra in your yard? Round-shaped leaves; an appearance totally unlike other pachysandra. Pachysandra crinkle green sheen makes the perfect ground cover for shady areas. It is part of the Japanese spurges family. Don't give up on that barren part of your lawn in the shade. If you are looking for a beautiful ground covering Pachysandra is the plant for you. 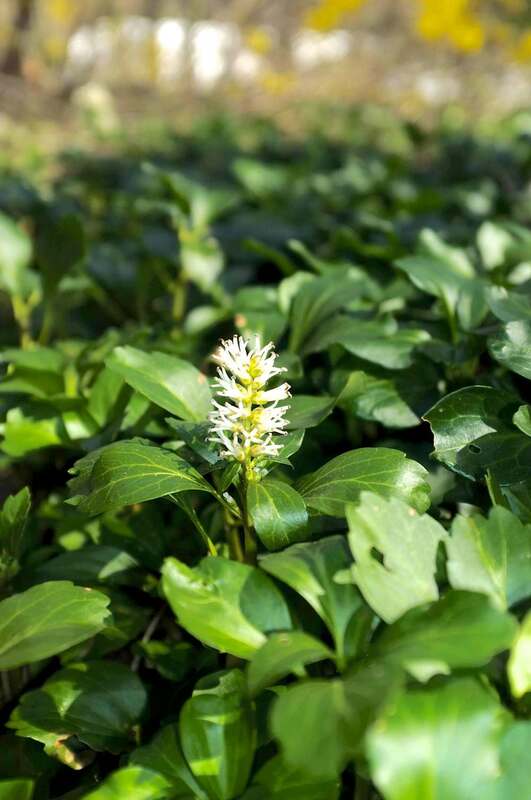 Millions homeowners and businesses alike have experienced the joys of having a green carpet Pachysandra. Pachysandra terminalis, more commonly known as Spurge, is an evergreen gift originally from Japan and other Asian countries. It grows close to the ground, never more than twelve inches in height, and provides a beautiful, slow growing ground cover for large open areas of landscaping. Pachysandra is a hardy and resistant plant, and if done right, transplanting it is an easy job. Low-growing, perennial ground covers like pachysandra can transform your landscape - and the way you garden - in amazing ways! Pachysandra is sometimes attacked by insects or disease. Here are a few tips as to what to look out for. Even though Pachysandra is a very tolerant evergreen, it is wise to follow a few hints and guidelines when you plant them in your yard. When you're looking to upgrade the landscaping in your yard, one of your plant staples should be pachysandra plants. Pachysandra plants, also known as Japanese Spurge is a dark green plant that grows best in shady areas. Do you have a shady garden and want something different for ground cover? Plant pachysandra plants instead of jasmine or English ivy. The ground cover pachysandra is native to Japan. It is an evergreen that spreads by rhizomes and forms a dense and compact form over the ground. Typically, it will get six to 10 inches tall. For the homeowner who wants to maintain a well groomed lawn, the idea of that lawn having bare spots in certain areas can be quite the annoyance. It takes a lot of effort on the part of the homeowner to keep a lawn well maintained. When planting pachysandra plants, you need to consider both the environment and the care that they will need to thrive. Though once they are established they can be quite hardy, it takes effort initially to make sure they survive and grow. Pachysandra plants are a low-growing evergreen plant that thrives in shady areas. While they are generally fairly easy to take care of, there are several steps that you need to take while caring for Pachysandra plants in order to insure optimal growth and health of the plant. Winter is coming to an end, and the first muddy, fragrant days of spring are right around the corner. What does this mean? It’s time for baseball season and garden work to begin. To grow ground cover plants is a beautiful way to add interest and color into an otherwise dull and unused area of your lawn, or garden. Ground cover plants, such as the Pachysandra will quickly grow to fill in the desired area of your lawn or garden, and create a low maintenance focal point. Pachysandra is a great evergreen ground cover. It is very easy to grow Pachysandra in the right conditions. Once planted, pachysandra requires little to no maintenance. If you are interested in gardening and would like to use Pachysandra plants, don't go to any of the big name stores because they tend to rip you off. Instead, buy your plants at JW-Pachysandra - you can't beat the low price and high-quality combination that JW-Pachysandra provides and our plants are environmentally safe.